Live mixing of different music genres. Every event and crowd is unique and reacts differently to many styles of mixing. Some crowds react well to the fast club style mixing, and other crowds prefer the song to play out a little longer. DJ Havok will read your crowd and immediately select a style of mixing for your special event. With over seven years of Wedding and Corporate event experience, DJ Havok has built an Emcee character that fits all styles of events. Although he is hosting your event he is still fully aware that this day is about you and not about him. Hvk can provide different lighting packages to add that "WOW" effect to your reception room. Offering up-lighting, custom monogram and dance-floor lighting for all types of events. 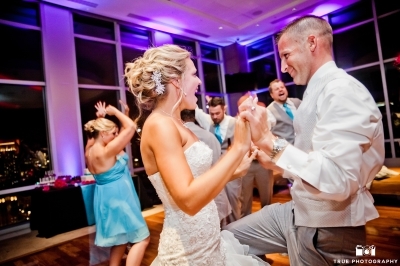 Hvk offers wireless microphones, speakers and custom playlists in our ceremony package. From the prelude to the recessional Hvk will set the tone you envision from the minute the first guest arrives until the end of your recessional. Hvk offers top of the line sound systems for both the cocktail area and reception ball room. Whether you have 30 guests or 1,000 Hvk will assure that the sound quality is top-notch for your event.